At the feet of Les Baux de Provence, a unique and inspired place. The Val d’Enfer is located below the village of Les Baux-de-Provence in the Alpilles. It is a natural valley dug in the rock by hydraulic erosion, and its name would come from the strange profiles of white rock limestone formations. Dante would have been inspired to describe his Hell in “the divine comedy”. Limestone quarries have been opened in this site since Antiquity, then bauxite in the 19th century. The exploitation of stone quarries at Val d’Enfer dates back to the 2nd century BC. The blocks of white limestone, fine-grained, were used for the construction of Glanum, a city Celtic, Greek and then Roman holy whose archaeological remains are near Saint-Rémy-de-Provence, Arles, and the castle of Les Baux of course, among other uses. Visible by their footprints, blocks two meters by a meter were extracted until the beginning of the 20th century by first hollowing out four corners with an iron bar. The corners were then connected progressively to each other, and it then remained to desolder the back of the block of its matrix using the angles. Subsequently, the technique of the “crocodile saw” facilitated this tedious cut somewhat. The chemist Pierre Berthier discovered bauxite at Val d’enfer in 1821. He gave it the name of “terre d’alumine des Baux” and the name Was subsequently transformed into “bauxite”. The first aluminum-producing industrial site in the world that uses bauxite is located in Salindres, in the Gard, from 1860. The exploitation of bauxite ceases in 1935 to turn to more profitable regional sites. or how careers are becoming < / Strong> Theater of artistic creations. It is in the Val d’Enfer that Frederic Mistral places one of Mireio’s chapters, but it is the visionary genius of Jean Cocteau who awakened abandoned quarries. Amazed by the beauty of the place, he decided in 1959 to turn the “Testament d’Orphée” there. Then Albert Plécy, photographer and editor-in-chief of the Parisian Libere, fell in love with the quarries of the Baux-de-Provence. He founded the Cathedral of Images and the first audiovisual show was born in 1977. It was based on the research of the great scenographer J. Svoboda who had developed ideas very ahead of the technologies available at the time. And for more than thirty years, the quarries of the Val d’Enfer have welcomed spectacles of sounds and lights. The spectator was invited to stroll freely among the photographs projected on the irregular high walls of the quarry halls, carried by the chain of images and music. It was thus that one could admire “Color Cézanne”, Venice “or” Picasso “, in 2006, 2007 and 2009 for example. 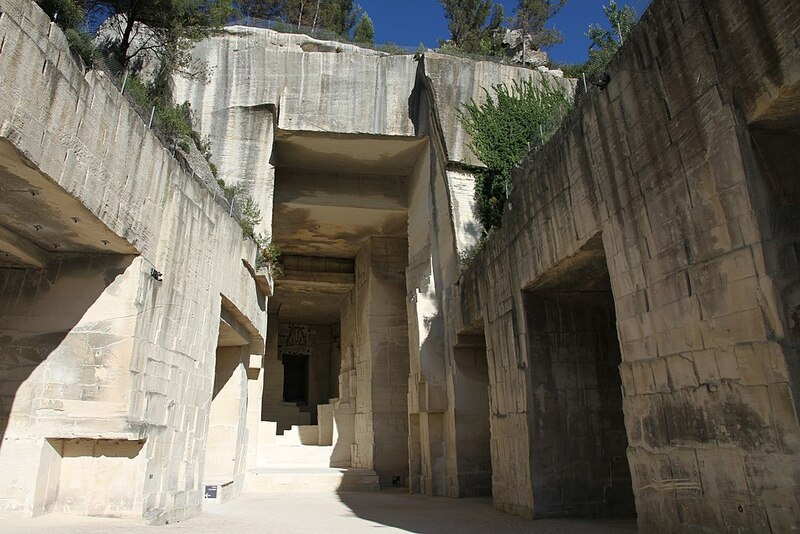 Then a new breath was given to the quarries in 2011 when the city of Baux-de-Provence entrusted Culturespaces with the management of these, as part of a delegation of public service. The Lumière quarries benefit from the experience of Culturespaces’ creative and cultural teams, as well as its investment capacities. To propose an original way to approach art through sensory immersion, Culturespaces develops at the Careers of Lights a device at the forefront of multimedia technology, thanks to directors and technicians able to adapt to the specificities of the place labeled ” Classified natural site “. In 2013, more video projectors and speakers were installed in the quarries to amplify the artistic experience. The video equipment is unique in Europe: 100 video projectors are driven by as many graphic servers projecting images on walls up to 14 meters high. As for the ground, it is completely covered and becomes an immense carpet of images. Each server delivers the programmed image to its video projector, the whole is synchronized by a production station which plays the role of conductor in this optimal installation. – A spatialized sound adapted to the constraints of the site makes it possible to create higher musical reception conditions. Each speaker covers 45 degrees of walls diffusing a more homogeneous sound wherever the viewer is. – The installation of the optical fiber, making it possible to fluidify the transmission of images, revolutionizes the installation. Indeed, each video signal is converted into light thanks to the optical fiber allowing to carry these signals up to 500 meters, in a resolution superior to Full HD. © 2019 Esprit provence - All rights reserved.